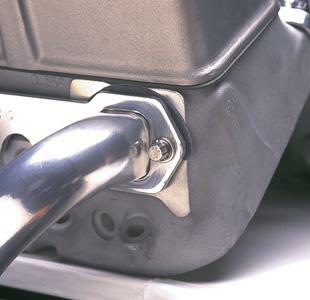 ARP manufactures a variety of premium grade bolt and stud kits to facilitate installation of exhaust headers including the popular stainless stud kit with 12-point nuts. The Stainless 300 material is not affected by corrosion or extreme heat, making it ideal for the application. What’s more, the compact 12-point nut lets you easily slip a socket close to the pipe. 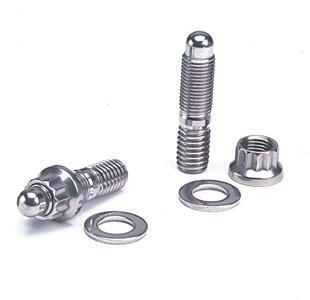 Each ARP accessory stud or bolt kit includes the specific number of parts for your application, plus premium-quality washers and hex or 12-point nuts, as required. Studs are manufactured with a unique nut-starter nose that helps prevent cross-threading. 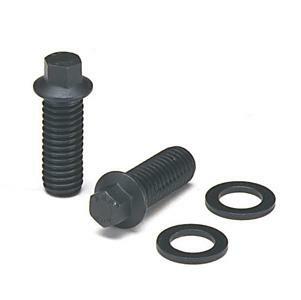 Studs and bolts come either black oxide chrome moly or Stainless 300. Both are nominally rated at 170,000 psi tensile strength; substantially stronger than Grade 8 hardware. Specially drilled “NASCAR” models are available for those who wish to safety wire their header bolts to prevent loosening. 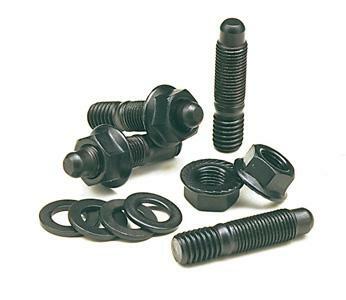 Special “NASCAR” model header bolts are available that are drilled for use of safety wire. Perfect for any racer who desires the ultimate in security. Available for small block and big block Chevrolet engines, plus many “universal” applications.